Hello you lovely lot and welcome to this weeks Read With Me. A big thanks first off to those who linked up last week. Lovely to see many of you linking up regularly! 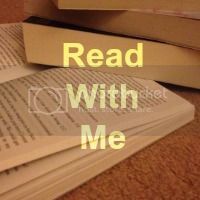 Last week was a slow week for reading for me, I had a child off sick part of the week and I also had a lot of blogging to catch up on so my spare time was rather sparse. I did however manage a couple of books. I received an ARC of Elle McKenzie's book, Dear Darling and you can read my review over on Goodreads. This is something I love about the blogging community, not only do we get the chance to review some lovely things but we also get to help with the feedback that we provide! The other book I read was The Years After by Leanne Davis. I'll admit to finding it slow going in the beginning but I felt drawn in by the characters and eventually the emotions from them all pulled me in. If you like a good angsty romance then this ones for you. My favourite post from last week came from Carole over at Carole Finds Her Wings. She reviewed a book called BUCKYBALL. The plot line sounds very intriguing so go and check out her review. On to this weeks link up. If you are new please check out the Read With Me page to see what it is all about. If you're a regular get linking (max of 2 posts or videos), commenting and hopefully displaying my badge. Hi Chantelle! Happy Monday! Thanks for hosting today.